Hilton Santa Barbara Beachfront Resort is a 24-acre mission-style hotel located on one of Southern California's most beautiful coastlines. The resort is just minutes away from downtown and the Santa Barbara Airport. Guests can indulge in one of three on-site restaurants. 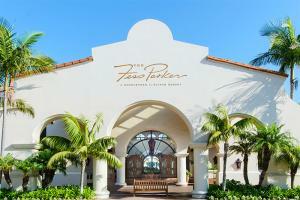 Accommodations include over-sized guestrooms with balconies or patios overlooking the ocean. Guests can discover California and Santa Ynez Wine Country with ease from this stunning beachfront resort. Located about 20 minutes from the Santa Barbara Airport and minutes away from downtown. Rodney's Grill - meat, seafood, wine; The Roundhouse - casual dining; The Set - full-service bar, salads and sandwiches. City Center, Fess Parkers Winery, Museum of Natural History, Santa Barbara Mission, Santa Barbara Zoo, State Street, Steam's Wharf, Whale Watching, Santa Barbara Botanic Gardens.